Q: How can a business entity create customer? Q: How do today’s customers make their choices from product available? Possibly, buyers buy from that business entity they perceive offers the highest customer delivered value. CDV is the difference between Total Customer Value and Total Customer Cost. Total Customer Value is the bundle of benefit customers expect from a product/ service. Total Customer Cost is the bundle of cost customer expect to incur in evaluating/ obtaining of using product or services. Eg.- Two Wheeler……. Choice – Hero Honda Splendor / Kawasaki Bajaj Boxer. – Image Value – customers perception of corporate image. – Policy of buying lowest price products. – Long term benefits not appreciated. – Other reason (Personal Friendship). Long term benefit is not appreciated always. When it comes to cost, people goes for lower one without realizing that they may now profit for a longer period. Person’s feelings of pleasure/ disappointment due to a comparison of a product perceived performance with his/ her expectations. Eg.- Satisfaction = Fn (Perceived Performance, Expectations). High satisfaction happens when perceived performance exceeds expectations. Successful companies raise expectations & deliver performances. i.e., Aim for total customer satisfaction. Q: How to deliver/ produce customer value & satisfaction? A: Use concept of Value Chain. – Proposed by Michael Porter. – Tool to create higher customer value. – Identifies main activities that creates (value + cost) in a business. – Inbound Logistics. – Procurement. – Operations. – Technology Development. – Outbound Logistics. – HR- Management. – Marketing/ Sales. – Firm Infrastructure. Task of Business Entity is to examine costs & performance in each value creating activity & try to improve it. – Performance of each unit. – New product realization process. – Setting high switching barrier . – Delivering high customer satisfaction (better approach). Starting point – Suspects/ Anyone who may possibly buy product/ service. Prospect: People who have strong potential interest in product & ability to pay for it. 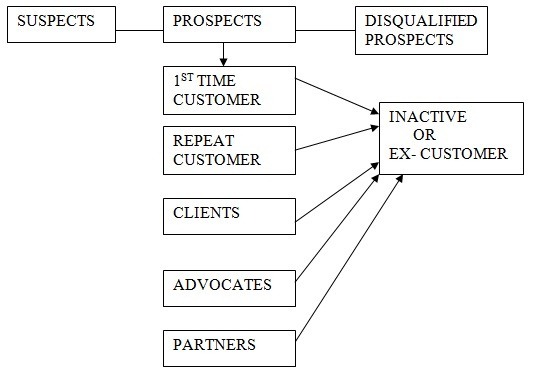 Disqualified Prospect: Company rejects due to poor credit/ unprofitability. Client: Buy only from company when they buy. Advocate: Customer who praise company & encourages others to buy. Partner: Customer & company work together actively to promote company. Developing loyal customer increases company revenues. However, company needs to spend more to built customer loyalty. Q: How much should a company invest in customer relationship building? A: Returns/ Profits from customer loyalty should b more than investment in customer relationship building. Based on above, five levels of company investment in CRB emerges. 1. Basic Marketing: – Sales person simply sales product. 2. Reactive Marketing: – Sales persons sales product. – Also ask for suggestions to product/ service. about improved products uses / new products. Frequency Marketing Program is designed to provide rewards to customers who buys frequently and or in substantial amount. Club Marketing Program is affinity group created for increasing bonding. Club membership offered on purchase of product or on payment of some additional fee. After some time, when all companies offer FMP/CMP, these may become financial burdens. Company personnel work on increasing social bonds with customers by individualizing/ personalizing their customer relationship. Effort is to convert customer to client. Eg.- ITC on notebooks donating some money , personalized cheque book. Supply customers with special equipment/ services to help them manage their work. Eg.- computer hardware supplier may offer basic computer training. Ultimately, Marketing has been the act of attracting & retaining profitable customer. Profitable Customer: Person/ Household/ Company that over time yields revenue that exceeds by an acceptable amount the company’s cost of attracting/ selling/ servicing hat customer. Previous articleWhat does CTC (Cost to Company) salary figure means in India ?